When we began researching our book Vaccine Science Revisited: Are Childhood Immunizations As Safe As Claimed? we weren’t quite able to figure out why babies receive so many vaccines before they start creating their own antibodies. We also wondered whether a vaccine would have a different effect on an infant than it would on a child with a fully developed immune system. Although we came up short on some of these concerns, we were able to get some answers, which we share with readers. “The best advisers, helpers and friends, always are not those who tell us how to act in special cases, but who give us, out of themselves, the ardent spirit and desire to act right, and leave us then, even through many blunders, to find out what our own form of right action is.” – Phillips Brooks (American clergyman and preacher). When a woman is pregnant, she carries a fetus which has its own sets of cells, its own DNA. It is its own individual being, which presents a problem for the immune system as it is designed to attack whatever is foreign in the body. This is an issue humans have dealt with since the beginning of time. Nature has forced the female body to adapt and accept new life growing within. The body has had a long time to evolve and improve. Long enough that it now has the mechanisms in place to deal with the conundrum of new life smoothly. Nature itself has prepared the female body to allow a foreign entity to grow inside it. In order to protect itself, the body uses many types of immune cells. One type is something called T-helper (Th or helper) cells. We have many different kinds of helper cells and their functions are distinguished by adding numbers to their names. The most significant Th cells in relation to this book are the Th1 and Th2 cells. The main function of a Th1 cell is to help destroy our cells already infected by germs. The Th2 cells balance this out by helping destroy the germs outside the cells before they get the chance to attack them. This creates a Th1/Th2 cell balance. In other words, Th1 cells recognize your infected cells and help kill them before they produce other corrupted cells. The Th2 cells recognize the free-floating germs and help create antibodies against them. In the case of the fetus, the Th1 cells are the problem. These cells believe the fetal cells are corrupt, so they signal an attack to destroy them. Since life has continued on this planet for who knows how long, it’s apparent that nature has taught the body to bypass this fetal destruction. The body’s immune system restructures its purpose in order to protect the fetus. It does this by suppressing the production of Th1 cells until after birth . This way, the body doesn’t have enough Th1 cells to attack what it believes to be corrupted cells. This means the Th1/Th2 balance is interrupted and the future mother now has tipped the scales towards Th2 cells. This also means the mother has mostly Th2 cells and very little Th1 cells available to share with the fetus. Therefore, the placenta transfers almost entirely Th2 cells to the fetus. It should come as no surprise that when we are born our immune system consists almost completely of Th2 cells. It’s not until the baby is exposed to the outside environment that Th1 cells become stimulated and start multiplying until they become a balanced part of the immune system again. We rely almost entirely on our mother’s antibodies until we are about six months old, which is when we slowly start developing a more complex immune system. As a baby starts building its own immunity, the mother’s antibodies disappear from the baby’s body. Something we weren’t quite able to figure out was why babies receive so many vaccines before they start creating their own antibodies. A vaccine is meant to encourage the body to create antibodies against it. We can see how vaccinating an infant that’s not good at creating its own antibodies yet, would only have limited protective effects. We also wondered whether the vaccine would therefore have a different effect on the infant than it would on a child with a fully developed immune system. Although we came up short on some of these concerns, we were able to get some answers we’ll share with you in this book. The first line of defense is the surface of our skin. The average skin pH is 4.7, which is acidic and ideal for our normal skin flora . Another acidic location is our gut. Those of you who are gardeners will likely know how difficult it can be to grow plants in an acidic environment. It’s the same with germs. Many germs don’t survive being in contact with such acidic environment. If the skin is compromised in any way, an open cut for instance, it will allow germs to make their way inside. This is where the germs meet our macrophages (i.e. phagocytes). They are called phagocytes because they eat everything foreign (phago = eat, cyte = cell). They are the first ones to the scene and will grab hold of the invaders then devour and destroy them. They don’t distinguish between the foreign particles. They don’t care what it is, as long as it’s foreign. The macrophages then gather genetic information about the invader and bring it to the lymph nodes where the T cells and B cells hang out. A quick recap: The T cells in question are the Th1 and Th2 cells. Th1 cells help destroy the infected cells and the Th2 cells help B cells make antibodies to inactivate the germs floating around outside our cells. As we just mentioned, B cells and Th2 cells work together in antibody production. Some B cells go by the name of memory cells because they remember information about the invader for the rest of our lives (or close thereto). This means that when the same invader attacks again, the memory B cells are alerted much quicker. The B cells carrying the information begin cloning themselves and start spitting out antibodies at a much faster rate. In nature, a germ is introduced to the body via the mucosal route such as the eye, nose or throat. When antigens (foreign invaders) enter the body naturally, the first defenders, which are a part of the innate immune system, respond instantaneously. Vaccines are designed to skip the first responders (innate immunity) and go straight for the antibody producing responders (acquired immunity). What’s worth noting is if a vaccine manufacturer states that its vaccine elicits T cell response, it doesn’t necessarily mean the vaccine elicits response from all types of T cells. This is because there are different types of T cells. We have explained that Th1 and Th2 are promoting an action and not actually performing the task itself. Hence the name helper cell. Like the Th1 cells. When we look at their function a little closer, their job is to relay instructions that tell Killer-T cells what to do. The Killer-T cells receive the instructions, multiply themselves until they are an army carrying the same instructions and then they go kill the corrupted cells they were instructed to kill. Once the Killer-T cells have destroyed corrupted cells, the macrophages come over to clean up the mess. The same goes for the Th2 cells. They carry instructions for the B-cells. After receiving instructions, the B cells will multiply until they are an army of cells carrying the same instructions. What good is a titer? The way physicians check to make sure your body has become properly immunized against a specific disease is to send you to the lab for a blood draw. Then your blood will be tested for the presence of the antibodies against specific antigens. A quick reminder, B cells produce antibodies. When checking for vaccine immunity, the antibodies are often measured in titers. When we learned how vaccine immunity is measured in titers, we knew it was measuring the activity of Th2 cells and the B cells. What was completely missing was the activity performed by the Th1 cells and the Killer-T cells. Given the way vaccinations are presented to our system, it seems to us there may be other factors than antibody concentration to consider. We found an interesting older study in The Lancet that tested individuals who were unable to produce their own antibodies . When these individuals came down with measles, they showed all the natural signs and symptoms of natural disease. After the course of the illness, they became immune to measles. The scientists conducting this study had blood drawn from these patients and tested it for antibody levels. There were no antibodies for measles in the blood (serum) samples. This goes to show that the immune system can create immunity against a disease without producing antibodies. And this means the immunity had nothing to do with Th2 cells or B cells, which are a part of the acquired (adaptive) immunity. This study could be an example of the great importance of our first responders, the innate immune response, which reacts to the initial exposure of a disease. Our innate immune system is nonspecific, it attacks anything foreign. Our acquired immunity, the one that produces antibodies, the one lacking in the individuals in above study, consists of cells which only attack what they’re instructed to attack. Most vaccines contain either inactivated germs or portions germs – an antigen nonetheless. If it were to be injected into the body all by itself, nothing would happen. It would just float uselessly around and the body wouldn’t view it a threat. The immune system needs to be artificially triggered and tricked into attacking these useless invaders. As a solution to this problem, scientists came up with the idea of attaching a substance to the vaccine antigen that would trigger B cells to produce antibodies. This substance is called an adjuvant. Up until the early 2000s, mercury was often used as an adjuvant. As a result of some severe consequences and pressure from concerned citizens, mercury was eliminated from most vaccines. The scientists knew the vaccine still needed an adjuvant if it was going to elicit an immune response. So, they added aluminum (Al) instead to do the job. An adjuvant is designed to shock the B cells (and Th2 cells) into antibody production. Each vaccine antigen is coated with an adjuvant. This raised two important questions for us: How many antigens are there in a vaccine; and when injecting multiple vaccines simultaneously, could this accumulation of adjuvants be more harmful – especially for infants? Unfortunately, there are far too many antigens in a vaccine to be counted. When adjuvants trigger antibody production for multiple antigens, the B cells are instructed to produce a wide variety and magnitude of antibodies. Keep in mind, it isn’t natural for the body to be exposed to a variety of diseases all at the same time, especially all bypassing the innate immune system (first responders). And yet how many times have you heard of children being naturally sick with multiple childhood diseases all at the same time? The CDC’s recommended childhood vaccine schedule recommends 69 shots up until age 18. This is not 69 different diseases. As you may recall, some vaccines require booster shots, so this count includes each booster as well. Some of these will be combined in the same vaccine. For example, measles, mumps & rubella (MMR) would be considered three shots as would diphtheria, tetanus & acellular pertussis (DTaP). If the foreign antigens are too numerous and overpower the immune system, they will have the opportunity to run wild, and multiply within the body and vandalize it. Whatever the body is unable to eliminate stays there. Once the vaccine ingredients are inside the body, is the body able to take care of them? Are they being excreted or are they accumulating? If they are accumulating, where are they, where are they going and are they causing damage? We hope to satisfactorily answer these questions and more in the coming chapters. Sykes, L., MacIntyre, D. A., Yap, X. J., Ponnampalam, S., Teoh, T. G., & Bennett, P. R. (2012). Changes in the Th1:Th2 cytokine bias in pregnancy and the effects of the anti-inflammatory cyclopentenone prostaglandin 15-deoxy-Δ(12,14)-prostaglandin J2. Mediators of inflammation, 2012, 416739. Lambers H., Piessens, S., Bloem, A., Pronk, H., and Finkel, P. (2006). Natural skin surface pH is on average below 5, which is beneficial for its resident flora.” International Journal of Cosmetic Science, 28(5), 359-370. Burnet F.M. (1968). Measles as an Index of Immunological Function. The Lancet, 292(7568), 610-613. Whether scientists intended it to or not, vaccines are quite effective in causing the body to react in a way nature did not prepare it for. We elaborate on this in an early chapter of our new release book Vaccine Science Revisited: Are Childhood Immunizations As Safe As Claimed? Vaccines entering the body come fully loaded with heavy artillery. Not all vaccine ingredients are well behaved, but rather are prone to vandalism once inside the body. In their defense, these ingredients are put in the vaccines because of their ability to ravage. Whether the scientists intended it to or not, the vaccines are quite effective in causing the body to react in a way nature did not prepare it for. Most of the vaccine ingredients and trace elements are added in order to provide safety and efficacy. Each vaccine is different and comes with its own recipe and ingredients. So far, regardless of which vaccine it is or which recipe is used, our immune system reacts accordingly. The body is extremely methodological in its defense/attack strategies. As authors, we felt it was very important to understand how some of these strategies work. The immune system is an extremely intelligent and intricate mechanism and we cannot possibly do it justice in only a few pages. In this chapter we share a fraction of its intricate puzzle, but hopefully it’s enough to make sense of how our bodies are designed to react when presented with foreign substances. Concepts such as the immune system adjusting to a growing fetus bring to mind other instances that may have had similar outcomes. The body adjusts to the germs in the environment and is able to protect itself from these germs and even draw benefits from them. Sometimes the germs are so clever at surviving and upholding their genetic makeup they become a part of our human DNA. A recent article at Livescience.com mentions some research papers on how ancient viruses could be the reason humans have conscious thoughts, a functioning immune system and are able to develop embryo. Another interesting finding the article points out is that we have a viral gene called the Arc gene . This gene plays an important role in writing genetic information and getting it across to other neurons. It’s so important, in fact, that without it, synapses will fade away. (A synapse is the area where the nerve signalling takes place: From the axon terminal, across the synaptic cleft and over to the dendrite). People who have been diagnosed with autism or other atypical neural diseases have been shown to have a dysfunctioning Arc gene. Having read some of the massive amount of information on vaccines and related topics, we do wonder if our bodies would have evolved in such a way to withstand the diseases that concern us today without help of drugs or vaccines. We understand that even before vaccinations, diseases killed huge numbers of people all over the world. As we mentioned at the end of the first chapter, when populations grew and people started living closer together, germs had more opportunities to spread amongst humans, especially where sanitation was a major problem. So, it makes us wonder if with improved living conditions would these diseases have been such a big issue? Did scientists become too focused on being a part of the medical revolution to see that perhaps the real solution lies in improving our environment? The story of surgeon Ignas Semmelweis, who claimed washing hands would make childbirth much safer, is one example of improving the environment. He is now known for the recognize-explain-act approach, which is still used today as an epidemiological model for preventing infections. In the following excerpt from our bestselling, new release book, VACCINE SCIENCE REVISITED: Are Childhood Immunizations As Safe As Claimed?, we highlight germs and different types of vaccines. You’ll see we discovered the differences between some vaccine types doesn’t seem to be clearly understood by many we’ve come across in the medical field. Some inactivated vaccines use the entire germ, while others use disease-causing portions of the germ. In vaccines containing the whole germ, scientists will inactivate or kill the germ in order to prevent viral replication. They do this by using chemicals. A chemical that’s very good at this job is formaldehyde (FA) or formalin (liquid form of FA). Even though the germ is killed and can no longer replicate, it’s still whole, so our immune system is able to recognize it and attack it. Unfortunately, the killed germ doesn’t keep our body immune as long as a living germ will, so we need to get booster shots every so often to keep the immune response up. Examples of vaccines using killed germs are Hepatitis A and polio (shot). When the disease is caused by bacteria, it’s often not the actual bacteria itself causing the sickness, but rather a toxic component of the bacteria. The goal of this vaccine is to inactivate the toxic component (toxoid), so it can be injected into our body without harming it. Toxoids are not quite the same as toxins. Toxins are the pure product of the bacteria and toxoids are the toxins after they have been chemically altered or inactivated in the lab. Examples of toxoid vaccines are diphtheria and tetanus. The differences between these types of vaccines (subunit/conjugate/recombinant) doesn’t seem to be clearly understood by many we’ve come across in the medical field. The conjugate vaccines, on the other hand, use only the bacterial sugar coat in order to “disguise a bacterium’s antigens so that the immature immune systems of infants and younger children can’t recognize or respond to them.” The coating also contains the information that makes us sick. But this is not an actual germ, so if it is just injected into the body by itself, we won’t recognize how dangerous the coating is. To solve this problem, the scientists attach it to a toxic molecule that will stir up our immune system. In order to attach the coating to the toxin, they need other chemicals to finish the job. By using a chemical, the coating material attaches to a carrier protein. Examples of these types of vaccines are the Hib, HPV, pneumococcal and meningococcal vaccines. The recombinant vaccines, use carriers or vectors “to introduce microbial DNA to cells of the body.” These carriers/vectors are weakened viruses or bacteria, meaning they mix and match DNA from different sources into one germ or cell. There are different ways to produce these vaccines. One way is to isolate a specific piece from a germ and use it in the vaccine. Another way is via genetic engineering. Here the germ is inserted into plasmid that has been manipulated by scientists. This type of plasmid is circular segments of DNA extracted from bacteria to serve as a vector. Scientists can add multiple genes and whatever genes they want into this plasmid. In case of vaccines, this includes a genetic piece of the vaccine germ and normally a gene for antibiotic resistance. This means that when the toxic gene is cultured inside the yeast, it has been designed with a new genetic code that makes it resistant to the antibiotic it’s coded for. The gene-plasmid combo is inserted into a yeast cell to be replicated. When the yeast replicates, the DNA from the plasmid is reproduced as a part of the yeast DNA. Once enough cells have been replicated, the genetic material in the new and improved yeast cell is extracted and put into the vaccine. Examples of this vaccine are the acellular pertussis and hepatitis B vaccines. One thing that doesn’t seem to concern scientists is the fact that the manmade genetic combination becomes the vaccine component. This mixture of intended and unintended genetic information may cause our immune system to overreact. This can be especially complicated for a child with compromised immune system. Another concern is that this new genetic code can become integrated with our own genetic material. Yeast, for instance, is very much like human DNA. It shares about one third of our proteins. Here you have substances that are designed to aggravate the immune system towards an attack. So, that’s what it does. Our immune system launches an attack on the invader. Sometimes the invader, like yeast, has many of the same protein codes as us. Our immune system downloads these protein codes and labels them as enemies. It signals a full-on attack on everything with that code in our body. Unfortunately, when the codes are similar, we don’t always know how to distinguish between vaccine proteins and our own proteins. Trace components that end up in the final product and become a part of the vaccine are usually left-over elements from the manufacturing process. These components were added during production in order to either keep cells alive or kill them or keep them free from contamination or to alter genetic materials during production. Other components are added to stir up our immune system to respond to the vaccine. As you perhaps can see, the materials scientists purposely add to the vaccine-making process serve the purpose of keeping us as safe as possible. The concern arises when these materials become a danger to our body, which becomes overwhelmed from being bombarded with toxins and protein particles. This attack is, for some children, too much to handle, and they suffer permanent ill health or lose the fight to live. What is it exactly that ends up in the vaccines our children are given, and what happens when these vaccines enter their bodies? We attempt to answer these questions in the next chapter. In the following excerpt from VACCINE SCIENCE REVISITED: Are Childhood Immunizations As Safe As Claimed?, we discuss Alzheimer’s disease, autism and aluminum. We would also like to touch on the subject of Alzheimer’s disease (AD) even though this does not affect children. We do believe it has some correlation to childhood diseases. The common denominator appears to be aluminum (Al) and other metals. As you may recall, aluminum can be much more toxic once it’s injected into the body. But as with so much else, we have to count on research that does not involve injections. Instead, we have to keep in mind the fact that being injected may potentially have greater adverse effects than what was observed in the studies. Authors of one such study published in 2009 explain that we are exposed to aluminum “through air, food and water.” They connect damage by free radicals and changes in neurological behavior to the impact aluminum has on the brain. This sparked a question in our minds: Is Alzheimer’s disease (AD) the same as autism? It appears to us that the difference between the two is with autism, everything happens a lot faster, while AD is a slower process and therefore occurs later in life. We are not so naïve as to believe this is the only difference. We are just curious whether there could be something to it. The incidence of autism around the globe is exploding. In 2014, an estimated 1% of the world’s population had autism. That means more than 70,000,000 human beings were, and many no doubt still are, struggling to function with a damaged brain as a consequence of this disease. The reports in from individual countries indicate the alarming scope of the problem. According to the World Health Organization’s (WHO) an announcement posted April 2017 on its website states: “[i]t is estimated that worldwide 1 in 160 children has an ASD.” Our concern with gathering worldwide data into one statistic is the fact that we don’t know the various methodologies used for each country. In US alone, there are three different survey methods used (mentioned below) and they all derive data differently. That being said, we would still like to see what the ASD prevalence data is in countries other than the US. The website Focus for Health has posted autism diagnosis for 18 different countries, including US with data from 2015, which shows one in 45 children with autism. The website derived their data from each individual country and they link references to each. The most recent data is from Germany, Ireland, Hong Kong and Singapore from 2016 and 2017. Here it shows Germany with one in 263 children with autism diagnoses, Singapore with one in 149, Ireland with one in 65 and Hong Kong with one in 27. It’s difficult to compare the three systems as they vary so much in the way they collect data. As described in the above quote, the NHIS surveys more than 12,000 children age three to 17 annually. The survey published in 2015 showed that “22.4 per 1,000 children” were diagnosed with ASD. That’s 2.4% of all children in US age three to 17. This may not seem like a high percentage, but let’s say you have 5,000 children in your school district, 112 of them would have autism. The reports show that in 2014 the autism rate nearly doubled from what it was from 2011-2013. As mentioned above, they contributed this to the more detailed description of ASD (i.e. inclusion of Asperger’s disorder). Nonetheless, it doesn’t explain the worldwide statistics. The Survey shown for ADDM is from 2010 and covers 360,000 eight-year-old children. The data was collected by “[e]xpert clinicians review medical and education records and apply surveillance case definition” . This survey showed an ASD prevalence of “14.7 per 1,000 children”. The difference here is the data was collected from health professionals and therefore included children not officially diagnosed with ASD (~20% of survey subjects). Both NHIS and ADDM were funded by the CDC. The last survey mentioned is the National Survey of Children’s Health (NSCH) conducted by phone in 2011-2012. It highlighted “[p]aren’t-reported survey responses about current autism spectrum disorder diagnosis”. NSCH reached over 95,000 children aged six to 17 throughout the US. According to their data set, the autism prevalence in this age group was “20,0 per 1,000 children.” This survey was funded by Human Resources & Services Administration (HRSA). More recent data from NSCH was published in the journal Pediatrics in November 2018. Using the same methods as described above, this study reached the carers of 43,283 children aged between three and 17. It showed by 2016 there was an ASD prevalence of “2.50 per 100 children” This means that an “estimated prevalence of US children with parent-reported ASD diagnosis is now 1 in 40” . According to the CDC’s website, ADDM data revealed one in 59 children had been diagnosed with autism by 2014. With the steady increase in autism each year, NSCH’s new data showing one in 40 children are being diagnosed with autism today doesn’t seem so far-fetched. Regardless, it’s safe to say that ASD is on the rise and becoming more prevalent than ever before. Another disease that perhaps not many have heard of is Pink Acrodonia, often referred to as the Pink disease. Caused by mercury in teething powder, this disease seems to have disappeared after the 1950s. The reason we mention Pink Acrodonia is because it has all the hallmarks and behaviors of an autistic child from head banging to a disconnect with other people. A study was done on the grandchildren of those who survived pink disease to see if there were genetic factors involved. They found that one out 22 pink disease survivors had grandchildren with ASD, while one out 160 from the general population had grandchildren with ASD. Even so, they feel there are other disorders worth a second look. These include obsessive-compulsive disorder (OCD, anorexia nervosa (AN), “tic disorder, anxiety disorder, ADHD, major depressive disorder, and bipolar disorder”. The study looks at correlation between these disorders and various vaccines. Among these vaccines were vaccines for “tetanus and diphtheria (TD), hepatitis A, hepatitis B, meningitis, and varicella”. The authors also stress that this is not proof of causal relationship. Whether they and others of the same viewpoint are right or wrong, the results from the study done on grandchildren of pink disease victims could hold the underlying answer. Our body has an innate ability to edit its DNA codes. This also means that when it is exposed to toxins, the editing process can be distorted and cause errors which become imbedded into the DNA. These errors are then passed on to offspring and render them more susceptible to toxic injuries or other disadvantages the errors may cause. The connection between the pink disease and autism brings to the fore something that has been brewing in the back of our minds for a while. It’s something we haven’t addressed yet, but feel strongly it deserves at least a passing mention before we end this book. We refer to the topic covered in the next and our last chapter: DNA epigenetics. Kumar, V. and Gill, K.D. (2009). Aluminium neurotoxicity: neurobehavioural and oxidative aspects. Arch Toxicol, 83(11), 965-978. Shandley, K., & Austin, D. W. (2011). Ancestry of pink disease (infantile acrodynia) identified as a risk factor for autism spectrum disorders. Journal of toxicology and environmental health. Part A, 74(18), 1185-1194. Will Bestselling Vaccine Book Soon Be Banned? 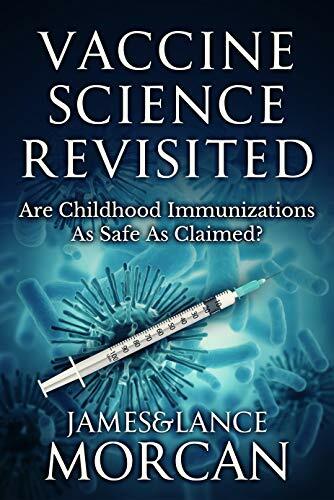 Will Amazon ban our new release non-fiction book VACCINE SCIENCE REVISITED: Are Childhood Immunizations As Safe As Claimed? For anyone who has not read the book (which is currently ranked #1 in several Amazon health bestseller lists), please note it is NOT anti-vaccines and simply lists all the latest scientific studies on vaccine research — allowing readers to make up their own minds. It’s 100% fact-based and neutral. But will any of that ultimately matter in our increasingly hysterical, politically correct culture where Big Tech’s Silicon Valley giants are implementing more and more censorship by the day? Developed in close consultation with a professional medical advisory team, and with a foreword by a medical laboratory scientist, VACCINE SCIENCE REVISITED: Are Childhood Immunizations As Safe As Claimed? is an unbiased, fact-based investigation that allows the science to do the talking on childhood vaccinations. This exhaustively-researched book avoids all rumor, conjecture and anecdotal evidence, and steadfastly focuses on what the latest medical studies actually reveal about vaccines listed on the immunization schedule. One by one the ingredients of the vaccines being manufactured today are put under the microscope by comparing peer-reviewed, published studies. No matter your level of education or experience – whether you are a doctor, layman, scientist, nurse, med student or new parent – be prepared to be surprised by many of the medical research findings in VACCINE SCIENCE REVISITED: Are Childhood Immunizations As Safe As Claimed? In researching VACCINE SCIENCE REVISITED: Are Childhood Immunizations As Safe As Claimed?, we discovered the differences between subunit, conjugate and recombinant vaccines don’t seem to be clearly understood by many we’ve come across in the medical field. The conjugate vaccines, on the other hand, use only the bacterial sugar coat in order to “disguise a bacterium’s antigens so that the immature immune systems of infants and younger children can’t recognize or respond to them.”2 The coating also contains the information that makes us sick. The recombinant vaccines, use carriers or vectors “to introduce microbial DNA to cells of the body.”3 These carriers/vectors are weakened viruses or bacteria, meaning they mix and match DNA from different sources into one germ or cell.